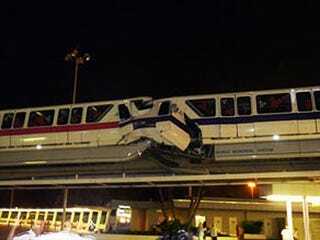 Two monorails collided on Sunday at the Disney World park in Orlando. Witnesses say a single train was stopped at the Ticket and Transport Center when a second train rammed it from the rear. The 21 year old operator of the moving train was unfortunately killed in the accident while a second employee was transported to the hospital and six other guests were evaluated on scene. None of the seven others had injuries and were immediately released. Disney officials have identified the train's operator as Austin Wuennenberg, a senior at Stetson University and a valued employee of the amusement park. "It's a terrible day for us, our hearts go out to to Austin and his family." It's a sad day when any young person loses their life, especially when it happens at the "happiest place on Earth."